If you’re wondering why I’m bringing up the topic of fear, you’re in good company. After all, doesn’t everyone have a solution for it already? In fact, there are almost as many solutions to fear as fears themselves. The answer is simple: fear is contagious. Until we develop a new relationship with it and stop falling under its attack, we remain at risk of feeling separated from others and ourselves. Simply put: fear keeps us divided and unable to be at our very best. 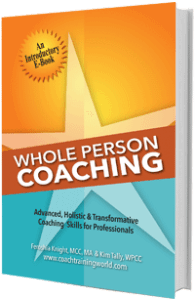 Throughout this past year, I’ve interviewed countless changemakers on their experiences dealing with fear for my upcoming book on Whole Person Coaching. I wanted to ensure that what was going into the book reflected the needs of future coaches. I was astonished by what I learned. Even though my interview subjects were quite successful at helping others overcome their own stopping blocks and fears, many of them had succumbed to second-guessing, questioning themselves, their decisions, and their work. Throughout our authentic conversations, the truth became glaringly obvious: fear had gotten the better of those who know better. My biggest surprise though was how much our conversation about their fears reminded me of my own. Yep. We are all vulnerable to the influential nature of our fears. No matter how much work we’ve done. After all fear is part of the human experience – as the refrain goes: with every new level comes a new devil. I believe the bravest people on this planet are those who can own their fears and are willing to do something about them. It’s likely you’ve heard the acronym F.E.A.R. (False Evidence Appearing Real). But what is fear really? Fear is an emotional byproduct of our neurobiological survival system. As you already, know it’s there for very good reason: to keep us safe, alive and on the planet as a species. In modern times, the fears we most often experience have less to do with saber-toothed tigers and more with our concern regarding what others think, feel or believe about us. As coaches, our primary task is to shine a light on the potential of an individual. It’s a process we know well – after all, stepping into our greatest potential is what got us to where we are today. We have a responsibility to those who seek our help: to keep our clients moving forward until their desired outcome is met. In many cases, this means helping them tell new, more empowering stories about themselves and others. And that requires a strong grasp on how to intimately work with someone’s fears – including our own. There are always setbacks, moments of self-doubt that cause our clients to stumble. There will always be visible and invisible influences that affect a person’s capacity to change. But because the “real work” for most people lies in their capacity to work with fear and other uncomfortable emotions, I created the following blog series. No matter who you are or what your current role happens to be, you’ll benefit from this conversation. If you are a change maker or influencer – whether your tribe resides in a workplace environment or your own client base – this series is especially applicable to you. With the complex and unpredictable nature of our times, everyone should be well equipped in this arena. As I frequently share with students in the training room, the number of clients who feel anxious, stressed, overwhelmed, and frozen in not knowing what to do next is growing daily. We can help them, but we need to help ourselves first. I need to say this again: fear is contagious. But the more resilience we develop, the more comfortable we are in its presence. And the more effective we can be to help others, as we make our difference in the world. In these next few posts, I’ll dig into the science and psychology of fear. What is fear? What are its underlying causes? When should you listen to it? What is it really trying to say to you? And most importantly: how can you partner with it to create peace, harmony and life-fulfillment without having to fight or run from it? With fear on your side, you can easily shift yourself and others from struggle to success. And that’s something we all deserve. By ignoring fear, we remain vulnerable to its next attack. We also run the risk of an unlived life and, speaking from my experience, unfulfilling relationships. Is that how you want to live your life? Me neither. So let’s use this as a starting point for our conversation with fear – when to recognize the wisdom it offers and when to shut the door. How does fear affect your world? How have your fears kept you safe?